Standing under the bright, fluorescent lights at the counter, I asked for a coil for an RX-7. The parts guy looked at me and laughed. Then he apologised for laughing, and shat on my dream. 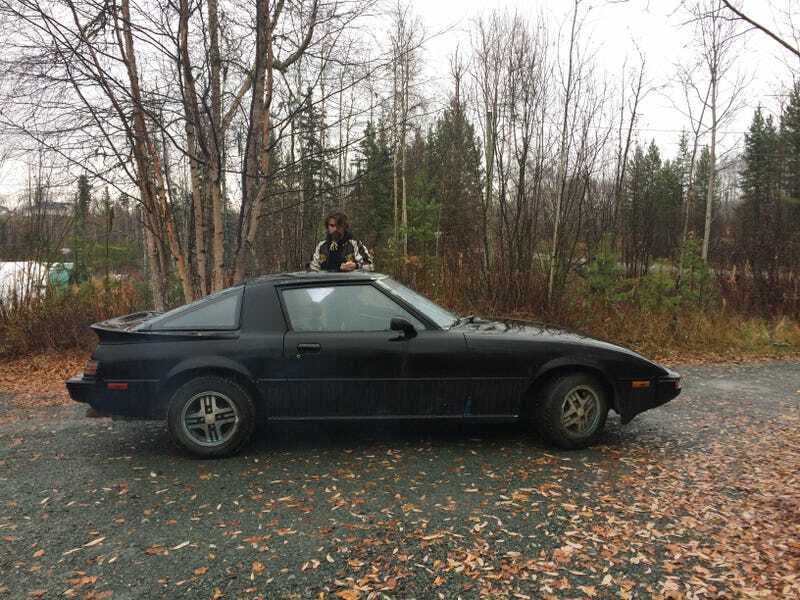 The dream was to chase out the gremlins that had been hiding in my car for over a year, then drive it 1000km from the middle of B.C to Southern Alberta. And, because I’ve made at least one good choice in my life, my wife agreed. The (Canadian) Thanksgiving long weekend gave us the time off work, so we bought ourselves a one way flight to my old home town and made wildly ambitious plans. The car had been sitting for over two years, since the 12A that was in it gave up the ghost and filled the oil with coolant. Roughly a year ago I (more or less) had finished putting a 13B from an FC (S4 if anyones interested in specifics) into my FB, only to be stymied from starting it in the thirteenth hour by a lack of spark. This time, though, it was going to be different. This time it had to be different, because there was no other way home. Thanksgiving weekend itself was a wash, as there was family to be visited and copious amounts of food to eat, but I was confident the foul lay in the coil (and thus was easy to fix), and equally so that I would find one. But then came the laughing parts guy, and his assurance I would find no coil for my car. I did not give up, however. And, as it turned out, he was pessimistic because he was looking for an FC coil to go with my FC engine, and I needed a coil for an FB, which is more your common, everyday coil than the later model one. So, Monday I found the coil, put it in and found that wasn’t the problem. After many swear words and no forward motion, I called it a day, with hope fading and parent’s that spoke glowingly of the depndability of the bus. Despite this, Tuesday I started trouble shooting. I searched the internet, before looking under the hood and finding two plugs on the distributor that I had neglected to plug in. After more swear words, said quietly so my mom wouldn’t glare at me, it fired. And it ran, kind of. If your foot was in it and stayed in it. Wednesday, when we were supposed to leave, I searched all of the internet for how to find TDC, as the timing mark on the pulley was gone. Then I fidled with the timing until it ran half decently. All that was left was to attach the exhaust manifold to the rest of the exhaust system and give it a shakedown run before we left. Thursday I dropped it off at the muffler shop to get the last half of the exhaust system installed and Friday I picked it up, didn’t go for a shakedown run, shot a bunch of oil over the rusty undercarriage to waylay the cancer and packed. Saturday, three days after we were supposed to have left we headed east. With a perforated gas tank and three jerry cans of premixed fuel. We hit the highway that morning engulfed in snow flurries; the car was loud, running rich, and the exhaust fumes were exiting out of both ends of the muffler. Despite this, and the cloud of smoke that followed us, we pushed on. We stopped in every little town we could to put fuel on until we hit Jasper, where we stopped to take in the scenery and a delicious sandwich at a wonderful little establishment. Then, we turned south down the parkway to Banff and plowed down south through the beautiful, mountainous parkway. I had no idea what was going on in the engine, as none of the engine gauges were hooked up to anything, but we soldiered on, stopping at roadside pullouts when the smell of burning gas and oil became too much for us. In the pass, it started burning (or somehow losing) oil. Or, rather, more oil than previously. I kept it topped up, and my foot light on the go pedal to limp it home. Just past Calgary, the passenger side window refused to go up, leaving us with slightly better air quality, but a rapidly dropping cabin temperature. We bundled up and pressed on, arriving at our destination early in the morning of the next day, ready to sleep and reeking of two-stroke smoke. Now the car rests about 900kms closer than it did, and is getting more attention. And if there’s anyone out there that knows anything of drifting happening at the old airport in Claresholm, drop me a line. The car may not have insurance or registration, but it’s close enough that I may show up anyway. Here’s hoping for a shorter break than last time between drives.